When applying for a job at a new firm, a hiring manager may ask for an employment verification letter to validate your claims. 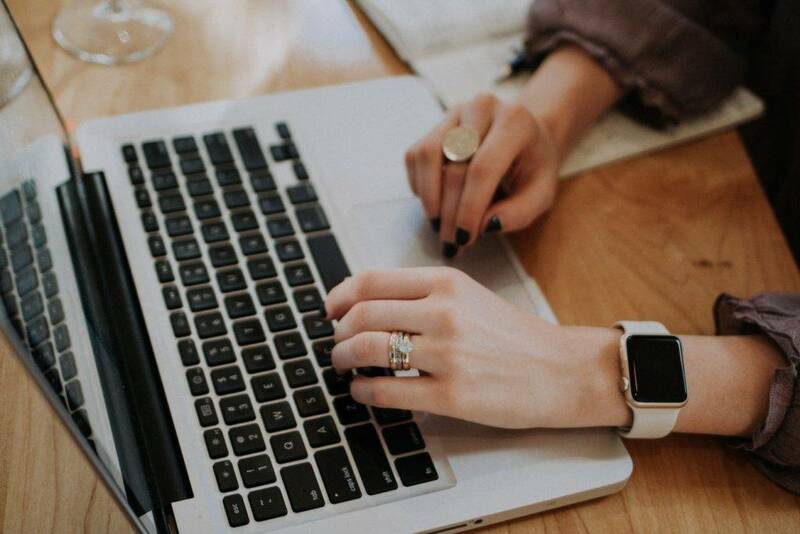 As a manager or member of the human resources department, it’s common for current or former employees to request for a verification letter for a variety of reasons. 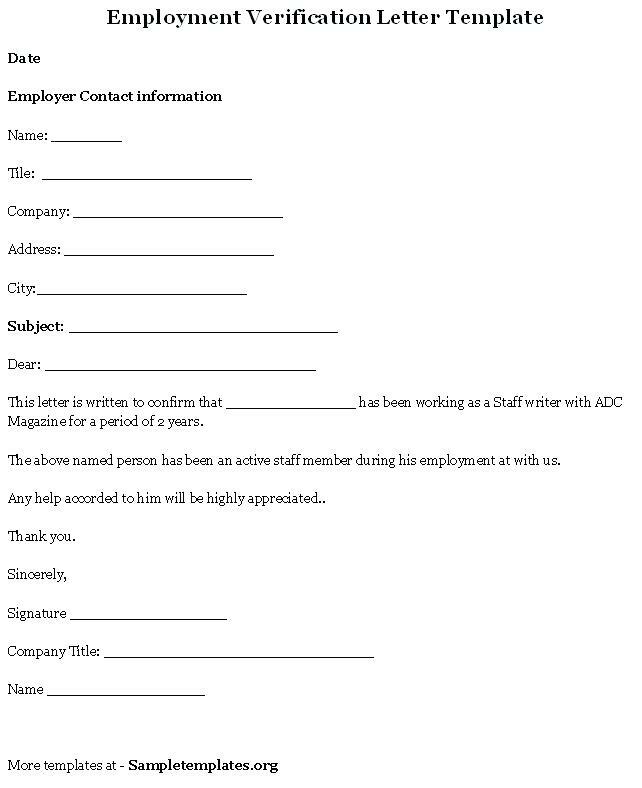 This letter is typically kept concise, and contains key information about an individual’s status as an employee. But similar to other business letters, a verification of employment letter must be constructed correctly and accurately through proper guidance. 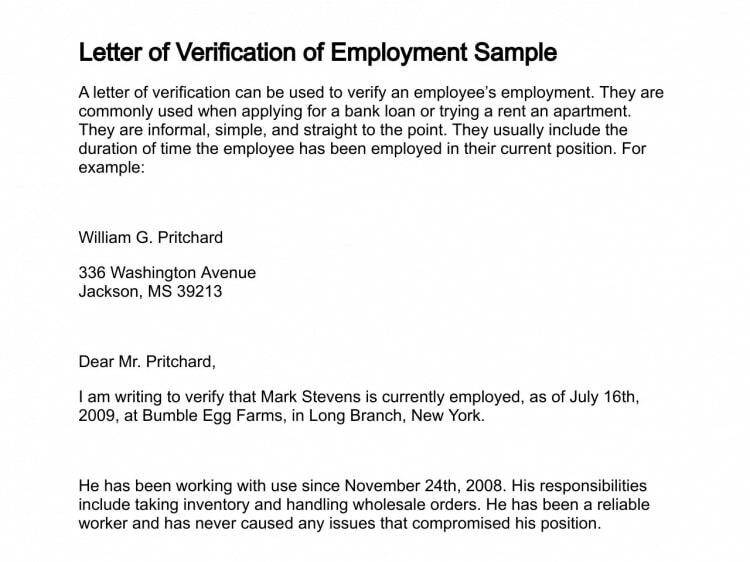 Employee Verification Letter: What is it? Before you carry on to creating (or perhaps even requesting) an employee verification letter, it’s best to begin by getting a better sense into what it really is. 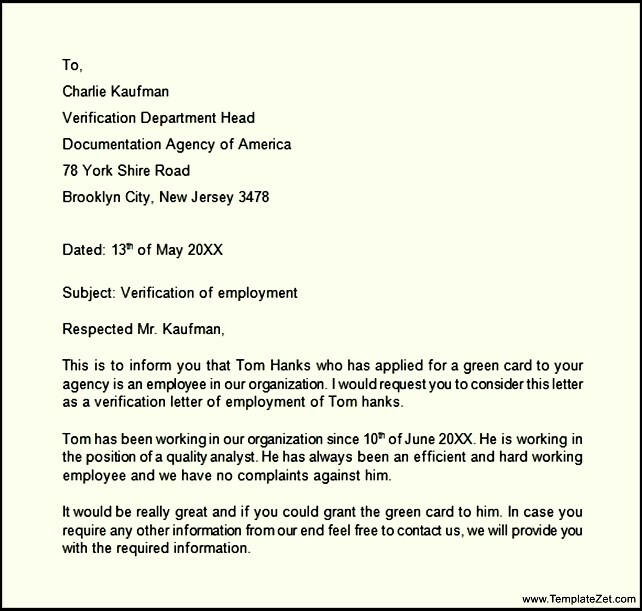 In certain cases, an employee may ask for a verification letter for different reasons. Banks often request for a certificate of employment or an employee verification letter to confirm the name of your current employer, your job title, and your annual salary as part of their requirements for you to be granted a loan. Oftentimes, financial institutions and some landlords will use this as proof to verify that you are earning enough income to pay for your annual or monthly rent and maintenance. There are also instances where potential employers may want proof of your previous or current employment. This is done to conduct background checks among job applicants to see whether or not they have been truthful about their employment history, though it may be illegal for the company to ask for your salary history despite the circumstance at hand. Apart from the purpose of future employment, this is also an essential document to confirm your current employment status for mortgage, credit, or rental application. Occasionally, the request may also ask further information regarding one’s employment history, the address listed in the employee’s file, salary growth, along with an assessment of an individual’s work performance. However, those responsible for issuing these verification letters must be careful when responding to such requests, as disclosure of classified information poses serious liability risks that may lead to legal issues. If the request asks information from a former employee, see to it that a release of the said information has been agreed upon with the respective individual through a signed document. You may also see email cover letter examples. Most HRs have this reviewed and cleared with an exiting employee when administering the employment ending process. Keep in mind that this request may be submitted by an employee working for your organization, or by the HR department of a company that a former employee has applied at. You may also like offer letter examples. 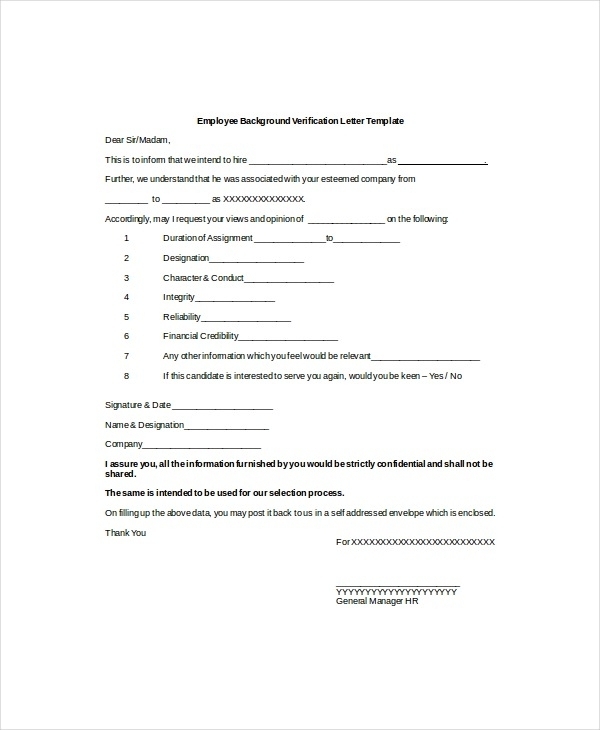 Requesting for a verification of employment letter may be done in different ways, depending on the entity responsible for the request, and the specific purpose of the said document. 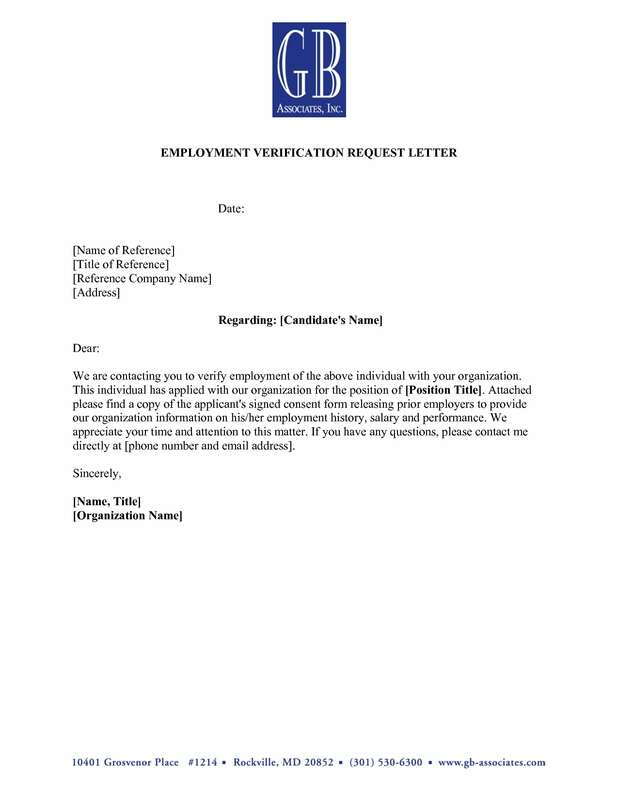 Employees requesting for a verification letter must handle the situation professionally. The request must be directed towards the HR department of the company, or perhaps even the employee’s manager or boss (only if such department does not exist in the organization). You may also see formal letter writing examples. The HR department may guide you through this procedure, or process the letter immediately after it has been requested. There also situations where the HR would provide with a form for your direct manager to use. You may also prepare your own template or form for the manager to use as basis — but don’t expect them to comply to all your requests, as there are some things that they may not be permitted to disclose in the verification letter. You may also like business proposal letter examples. Be mindful about what you include in the request, and be sure to keep it as reasonable and as professional as possible. Whether you’re requesting to verify the status of an employee for credit reasons or looking to prove one’s employment status for a proposed deal, loan agreement, or other non-employment reasons, make sure the request is kept brief and formal. 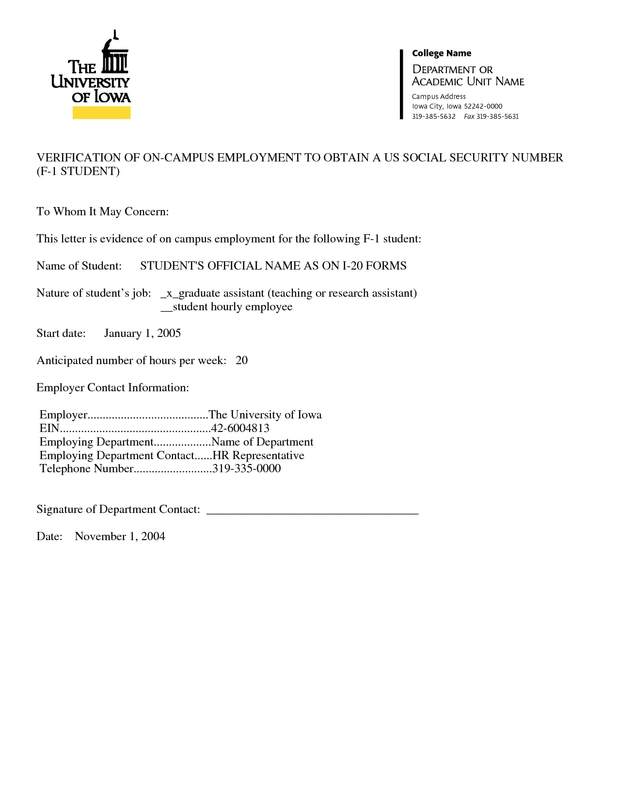 One’s basic employment is typically asked in this type of letter, specifically an individual’s name, job title, salary, and date of employment. You may also check out how to write an official letter. Before letting a person become a part of your corporate workforce, it’s important to verify whether the applicant has provided you with accurate information. There have been numerous cases where job applicants have given false information to prospective employers, or have even faked their verification letters to make themselves look good. You might be interested in business reference letter examples. Because of this, hiring managers are usually required to administer proper background checks of potential employees as part of the organization’s protocol. This acts as an essential part of the screening process, and is often conducted through letter writing than by phone. HR managers understand the struggle with finding reliable employees these days, so there’s nothing wrong with asking about an individual’s work performance, reasons for leaving the company, abilities and skills possessed — considering how some applicants have the tendency to exaggerate their capabilities in order to impress future employers — and other work-related aspects that may concern you. However, steer clear from impermissible inquiries that may be too classified to disclose, such as a person’s health status. You may also see notice letter examples. For your own convenience, you can also prepare a letter template to suit this purpose, and then have a lawyer clear it to avoid any red flags. 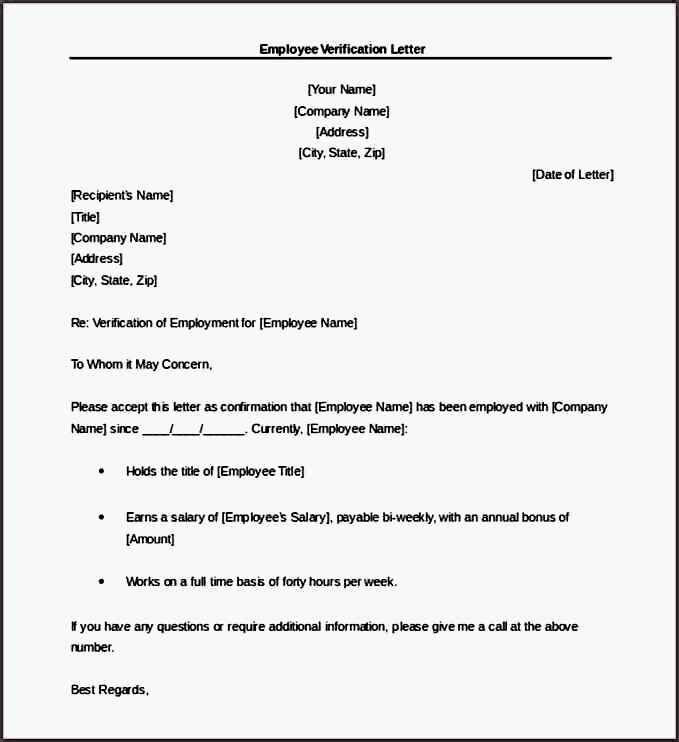 Like any other business letter, an employment verification letter must be written with care. The entity responsible for constructing the letter must respond to each request professionally through a well-crafted letter. Though writing a verification letter for a current or former employee may seem like an additional task for you, keep in mind that this formal letter may have been requested for a personal or professional reason which plays a significant role in the life of the respective individual. With that in mind, the writing process must be taken seriously. In most cases, this is coordinated with the HR department of the organization, which may consist of certain steps and processes for you to take before the letter is provided to whoever made the request. If you are asked to write the letter yourself, you need to make sure that the letter reflects positively on the business it represents. Start by using an official letter or business format to construct the letter. The letter must also include your contact information, the recipient’s contact details, a formal salutation, a handwritten signature, along with what has been asked. Be sure to supply a printed copy of the letter to keep it professional as well. For verification letters that are written by an employee to be signed later on by the manager or HR, ensure that the content of your letter meets company standards. Most organizations do not permit their own employees to create these types of letters without the permission of the HR department, so you must make sure that they have given the go signal for this to be carried out first. Though you may be responsible for writing the letter, the HR department is the only entity authorized to further verify its content for credibility purposes. You may also see cover letter examples. Any formal letter ever written must observe proper formatting. This consists of the recipient’s address and the date of the letter found at the upper left portion of the paper, followed by the salutation, body of the letter, and the closing. 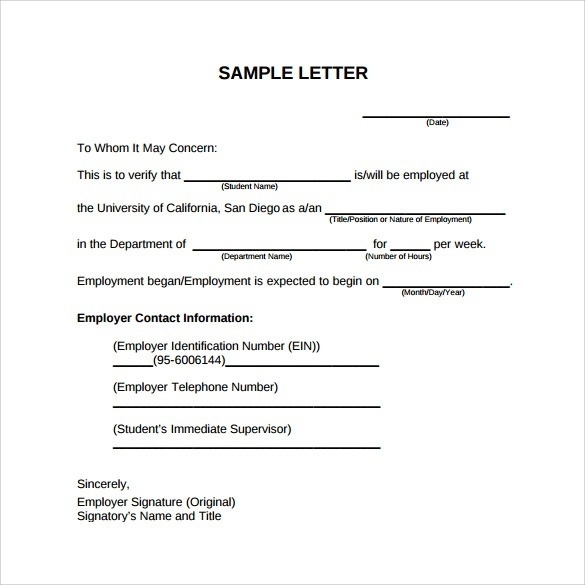 Most employment verification letters contain two paragraphs, where the first paragraph is composed of relevant information, and the second paragraph suggests that the recipient reaches out to the person who wrote the letter for any further assistance. As someone responsible for representing your office, you need to inform the recipient of your status in the office and how this may relate to the employee in subject. For instance, if you’re the manager in charge of the department in which the employee is a part of, then this would prove that your input is reliable and permitted to the purpose of the letter. You may also see thank-you letter examples. Never forget the most important part of the letter: a general statement that verifies an employee’s status in the office, date of employment, and other offices that holds the said employee. The latter pertains to situations where the employee is part of a sub-sector of the company, which may also be under another department of the said organization. Avoid going above or over what has originally been requested by a recipient. You must only include the exact information that has been requested by providing it in a summarized format. If the information demanded cannot be shared due to possible legal issues and corporate policies, then refrain from adding it to your letter. You may also like complaint letter examples. If your state law does permit the disclosure of sensitive information in business correspondence, then you have every right to do so. The employee’s performance and behavior in the workplace may be conveyed in the professional letter, as well as possible charges that have been filed against the employee, such as sexual harassment claims and the like. Before responding to these types of requests, be sure to read through your local employment act to avoid any conflict. Finally, it’s always best to leave your contact details for further inquiries. If the person who has requested for the verification letter has questions that need to be clarified, they could easily reach you to have these addressed immediately. 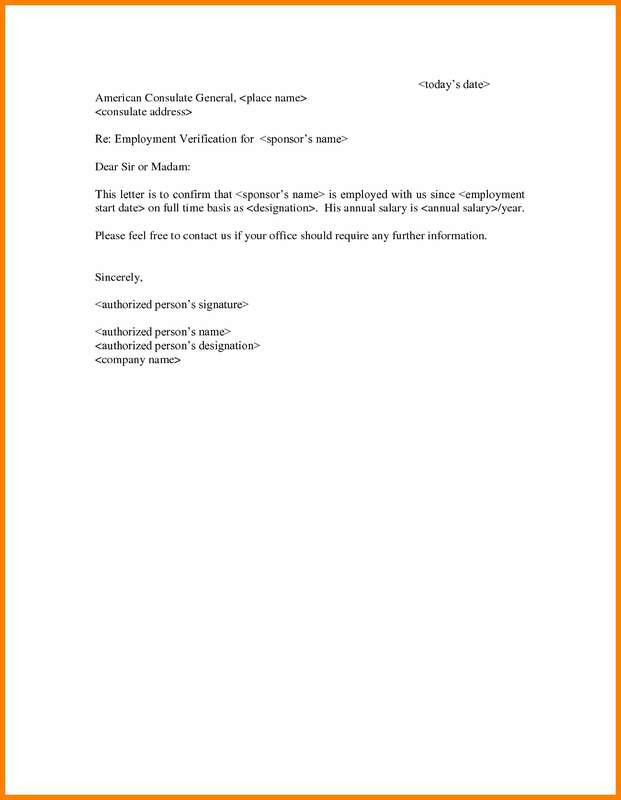 A verification of employment letter is a formal document that could help a prospective employer or a non-employment entity finalize a delicate decision. For this reason, the letter must be written seriously and professionally for the benefit of all. When constructed correctly, it is sure to deliver its desired purpose with ease. 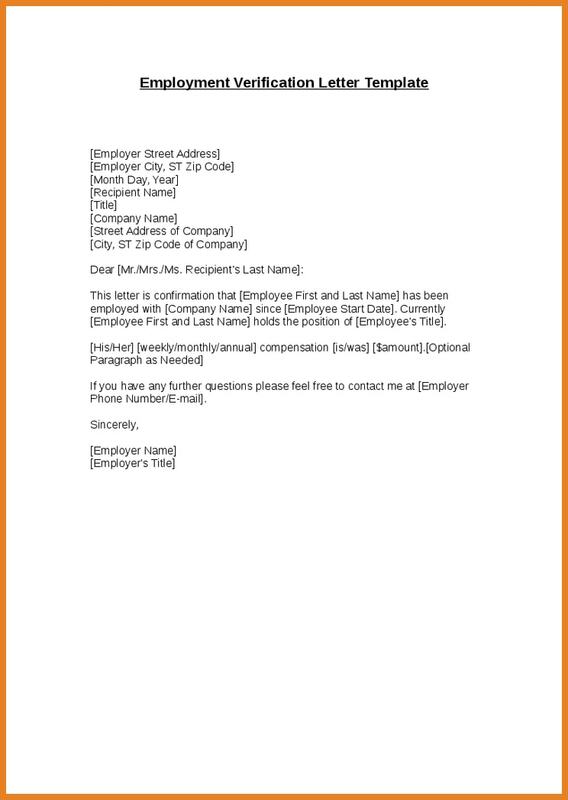 You may also see job application letter examples.